GSM Social Tool v1.0 is a small application for windows computer created by GSM Team, which allows you to remove network lock protection from your Oppo device. It supports Oppo devices such as Oppo F9, Oppo F9 Pro and Oppo A83. GSM Social Tool v1.0 comes with simple and easy to use interface which allows you to get your job done in few seconds only. Since, this tool is an open source tool. 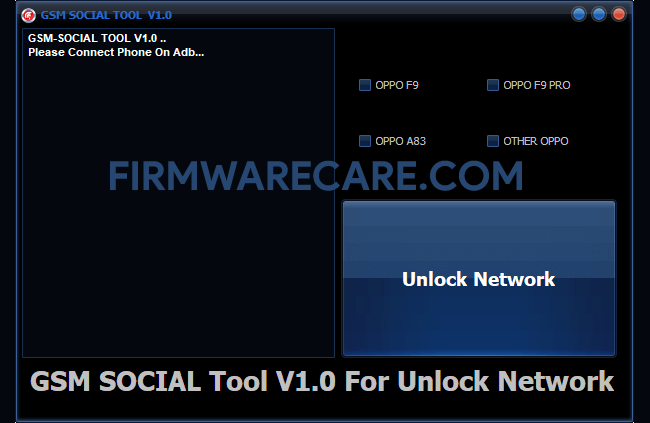 You may use it free for always to remove network lock protection from your Oppo Smartphones. It is especially designed for Oppo F9, Oppo F9 Pro and Oppo A83. If you’re using any other model of Oppo, then it may or may not work for you. In order to use the GSM Social Tool, you need to install the Universal ADB Driver on your computer. [*] Compatibility: The GSM Social Tool runs perfectly on Windows XP, Windows Vista, Windows 7, Windows 8, Windows 8.1 and Windows 10 (32 bit and 64 bit). [*] Credits: GSM Social Tool is created and distributed by GSM Team (developer). So, full credits goes to GSM Team (developer) for sharing the tool for free.